For some reason Ghost Busters (1984) was never a real formative film for me, despite some of my absolute favourites coming from that era. I am sure I had seen the film on TV years ago, but I only had pretty vague recollections of it, making this viewing almost like seeing it for the first time. It’s weird that whilst the 80s was a pretty dire time for some other art forms (I’m looking at you music), it was a great time for film, especially popular film. Ghost Busters is a definite part of that. This New York set film sees three academic scientists who are kicked off campus go into the ghost hunting business. Lucky for them, that is a field of work that happens to be in high demand at the time. Much of the humour in the early parts of the film comes from the sheer lack of experience or knowledge that our heroes have about what the hell they should do when they happen upon a ghost. This makes their early experiments in ‘ghostbusting’ hilariously fraught. But luckily for the folk of New York, they are also generally successful in these endeavours. Especially as the supernatural goings-on really ramp up, culminating in a Stay Puft Marshmallow Man Godzilla sized beast rampaging through the streets. As will happen. The supernatural happenings are driven by what I assume were some pretty impressive for the time special effects that by and large have aged relatively well. There are some definite exceptions to this rule, but the effects are there to only enhance the other aspects of the film, they are not the focus of the film itself. A lesson there for many a filmmaker I think. The two major strengths of the film are the sharp comedy of the script and the fantastic cast. 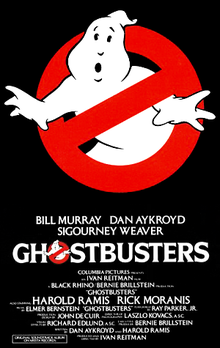 Two of the stars of the film, Dan Aykroyd and Harold Ramis were also on writing duties. What they turned in was a wryly comedic gem that will have you chuckling throughout, without feeling like you are being beaten over the head with an endless bombardment of jokes. Another major credit to the script is that it actually gets stronger as the film goes on, with many of the funnier lines coming toward the end of the film. If you really wanted to quibble, there is a plot diversion and character or two that are underdeveloped, but in reality it is highly doubtful you will notice. Plus, as with any high quality film of this ilk, there are a bunch of really quotable lines peppered throughout. Most of them are delivered by Bill Murray, such as the classics “he slimed me” and “cats and dogs living together”. Murray is definitely the star in terms of screen time and his performance is really good too. He is able to comfortably nail both wry, dry humour as well as the odd bit of silliness. He is really well supported by basically everyone else as in the film, with my personal favourites here being Rick Moranis and Sigourney Weaver. Moranis especially creates a really full and fun character in his short time onscreen. Man I love that guy, watching this film brought back plenty of memories of a film that definitely was a formative one for me, Honey, I Shrunk the Kids (1989). In the end, Ghost Busters is just about as fun as a film can hope to be, managing to mix elements of comedy, horror and fantasy all together to come up with something highly original. I can definitely see why this is an absolute favourite of many and a really formative film for a lot of huge film fans. I will be live tweeting a film this weekend, so please head here to have your say on what film it should be. It is a good film that stands up for itself. The following was IMO enjoyable too.. Cheers for commenting. Yep, I think the film has aged pretty well considering when it was made. Nice review. I love Ghostbusters, one of my favorite comedies. I like the sequel a bit more than others but it’s far weaker than the original. Thanks for commenting man. The DVD I got out from the library has the sequel on it, so I will try and give that a watch over the next few weeks as well. Ghostbusters? Never heard of it. Little indie flick. Didn’t make much of a splash. Showing flicks to your kid must be awesome. Assuming she has good taste in movies that is. Great job tackling a classic movie – I always find things like these hard to write about – great post! Cheers man, glad you enjoyed it. There is always that fear that a movie is so revered that there is nothing else to add to a discussion about it. I’m sure you can pull something off about Rocky. Your review of One Flew Over the Cuckoo’s Nest was a good read. Thank you!! You have inspired me to give it a shot! This was definitely formative for me – so many good memories with this one! I think there are many people in the same boat as you with this one Misty. An excellent film that despite being rather light on the horror is still a nostalgic favorite of mine. The main adversary in the second Ghostbusters film used to terrify me as a child, haha. Oh cool, I am intending on checking out the second one soon, so will report on me feelings about the villain.